µChip comes to Birmingham for a 3-day event celebrating Chiptune music, digital art, hacking, modified hardware and unconventional approaches to making music and visual art. 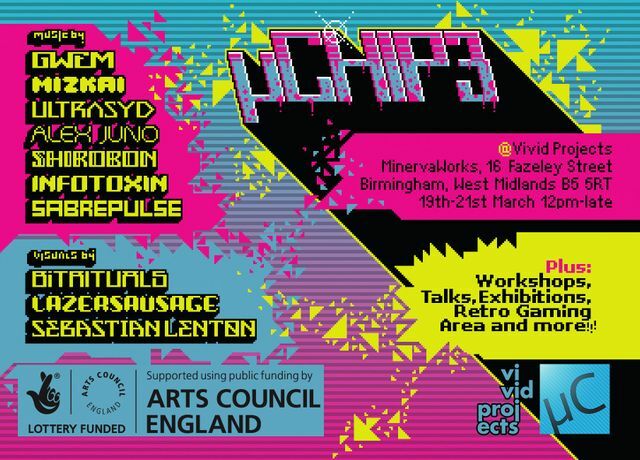 µChip 3 will feature hands-on hacking workshops and demos alongside an exhibition of vintage computers, digital art, video screenings, and performances from a range of local, national and international Chiptune musicians. The ambition is to inspire and empower participants of all ages to engage with creative media in new and unconventional ways. WORKSHOP: Antonio Roberts/Hellocatfood will lead participants on a journey through source code hacking and glitch art. Open to all ages, no prior experience necessary. Admission £5, capacity limited - book to reserve your place. WORKSHOP: Sam Wray/2xAA will teach participants how to use LSDJ Game boy software to make electronic music. Admission £5, capacity limited - book to reserve your place. Visuals by bitrituals, LazerSausage and Sebastian Lenton. 8Bit Lounge presents retro 16bit games consoles including SNES, Megadrive, Master System, and Commodore 64. Admission £5, book to reserve your place.